Ever yearned for a space so vast that the horizon continues into the future? Or to see the stars so clearly you feel that you touch them? The Karoo Highlands Route is where you can experience such uniqueness. The area is renowned for the hospitality of its farming community. 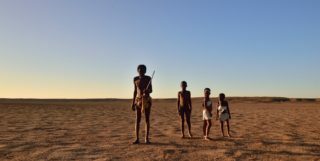 Whether you’ll be admiring the inimitability of the corbelled houses or looking back in time at the Gansfontein palaeo-surface, your heart will surely be touched by this region as never before. The Karoo Highlands Route is situated in the southern part of the Northern Cape. The route covers the small Karoo towns of Nieuwoudtville, Calvinia, Williston, Sutherland, Fraserburg, Carnarvon, Loxton and Victoria West, and forms the heart of the Great Karoo. The Karoo is the home of peace and tranquillity where you can recharge your batteries while exploring the wide open plains dotted with koppies (hills). This is a place where a huge telescope allows you to look back to the beginnings of our universe 13-billion years ago, and where pre-dinosaurs roamed the Earth and the first people gazed up to the heavens. People have lived on this massive plateau, the largest of its kind outside Asia, for about 500 000 years. 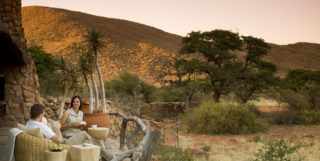 The Khoi and San people who left their legacy as art on the rocks gave the Karoo its name. The area’s name comes from “karusa”, a Khoi word that means dry, barren, thirstland. This aptly describes this region, where water is scarce. It is an ancient, fossil-rich land, with some important archaeological sites, as well as the largest variety of succulents found anywhere on Earth: there are more than 9 000 plant species in the Great Karoo. The route offers plenty of interesting attractions, such as Sutherland’s astronomical observatory, the Square Kilometre Array (SKA) radio telescope; Karoo architecture and corbelled houses; Anglo-Boer War sites; rock art; ancient palaeo-surfaces; farm stays; and medicinal plants. There is a lot to do on this small but unique route. The area is famous for its successful sheep farming, and it is one of the best stargazing destinations in the world. In the Karoo there is something for every traveller – there are quiet and scenic vast landscapes, friendly local people, traditional food and a whole lot of adventure. The various small towns, including Carnarvon, Loxton, Victoria West, Vosburg and Williston, each offer something different from the other. A self-drive excursion through the Appie van Heerden Nature Reserve is a sight for sore eyes in this arid part of the Northern Cape. The 860ha nature reserve is located just outside Carnarvon, and here you will see spectacular Karoo veld vegetation that forms part of the Karee mountains. Spot various wild animals, including besbok, black wildebeest, zebra, springbok and gemsbok – all of which used to roam this part of the country freely before the commencement of sheep farming in the region. Enjoy a walk in and around the town of Victoria West. The town was established in 1844 and named after Queen Victoria of England. There are lots of discoveries to be made, such as the 1950s art-deco cinema found at the Apollo Theatre, as well as the town’s museum with archaeological displays of fossils that once roamed the area and the Anglican church that was built here in 1847. You will spot plenty of birdlife and plant life as you make your way to Moonlight Hill, where various hiking trails lead you to spectacular views of the Karoo landscape. 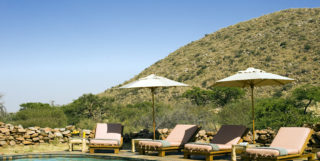 The Carnarvon Hotel offers affordable accommodation in the heart of the Karoo. The hotel has comfortable accommodation, a large hall for functions and meetings, a barbecue area, and the famous Blikkies bar. Attractions close to the hotel include the Carnarvon Museum that was built in in 1907. Hantam Vleisfees – The Hantam Vleisfees is an annual meat and music festival celebrating Calvinia in the Northern Cape. 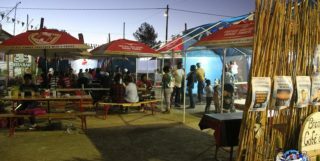 Various meat dishes are sold at the festival and prepared in different ways – braaied, stewed, curried, in pita breads, on sosaties and in potjies. This is a proudly South African experience and a must for visitors travelling through this part of the province. For more information, contact +27 (0)27 341 8200 or email vleisfees@klk.co.za. Williston Winter Festival – This annual festival celebrates the end of winter and highlights the culture, heritage and history of the people in this part of the Karoo. Local performances include the riel dance, a traditional group courtship dance performed in a circle. During the dance, ladies stay on one side while the men mock-battle in a way that narrates a story. For more information and general enquiries, email willistonwinterfees@gmail.com. Stargazing in Sutherland – Sutherland is regarded as one of the world’s prime stargazing destinations. This small town in the heart of the Karoo desert is home to an observation station of the South African Astronomical Observatory, which is strategically positioned in the region due to its pollution-free air and cloudless nights for most of the year, its semi-desert setting, and its high elevation above sea level. For bookings, contact +27 (0)23 571 1481 or email info@sutherlandinfo.co.za.